GEORGE TOWN: Investments from Malaysia in the Australian property market is expected to grow by about 15% this year from RM125mil in 2011. Property Talk director Steven Cheah said in an interview that for the past two years the investment in Australia had remained flat at about RM125mil per annum. “This was due to the stronger Australian dollar. But since March, the Australian currency had weakened slightly and so we are anticipating more property investments in Australia. “We have also been getting a lot more enquiries since March 2012 about investing in properties in Sydney and Melbourne,” he said. Cheah said every year many Malaysians go to study in Australia, thus creating a severe shortage of property for rental. “Many parents find that buying property for their children make more economic sense than renting. Once their children completed their education, the property can be rented as rental income or they can sell with good capital income,” he said. According to Cheah, Melbourne was the top destination for Malaysian property investment funds. “This is because many Malaysians have relatives who have migrated to Melbourne, where you can find a variety of Malaysian restaurants. “According to the latest research by Australian Property Monitors, of the major capital cities, Melbourne has been the standout performer for house price growth over the last five years, with prices increasing almost 30% in just 15 months. “Perth was the worst performing city, with the median house price unchanged in five years, which is largely a hangover from a resource-fuelled boom in prices in the early 2000,” Cheah said. He added that Sydney and Melbourne were always voted as the top three most livable cities in Asia by ECA International, a research firm with its Asia headquarters in Hong Kong. 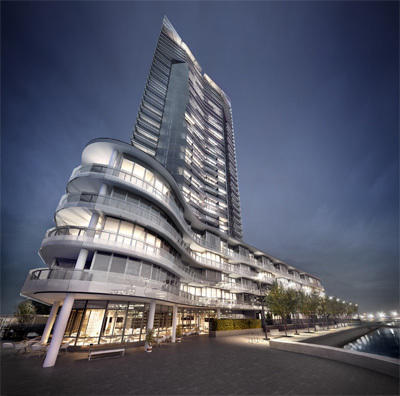 On Mirvac's new project in Melbourne, Cheah said the Array project, comprising 169 condominiums was next to the Yarra River. “The project, introduced in Shanghai recently, received very positive response. Some 35 units were sold in one week,” he said. The Array condominiums, positioned on the north-facing bank of the Yarra River, with built-up areas from 55 sq m onwards are priced from A$513,000. “A limited number of three bedroom, deluxe Sky Residence options, priced from A$1.41mil, is also available,” Cheah said. The project will be exclusively previewed at Hilton Kuala Lumpur on June 9 and June 10. “Construction work on the Array project has started and is scheduled for completion in end-2014,” Cheah added. 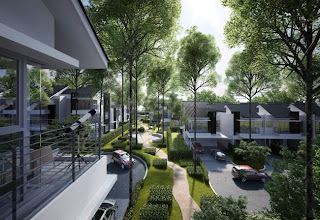 KUALA LUMPUR: SP Setia Bhd was recognised recently for the second time running as the developer Malaysians trust most in the Reader's Digest Asia Trusted Brands 2012 study. The company was awarded the Gold Trusted Brand Award in the Property Development category at the gala awards dinner held last month. 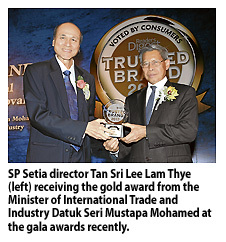 Minister of International Trade and Industry Datuk Seri Mustapa Mohamed presented the award to SP Setia director Tan Sri Lee Lam Thye. 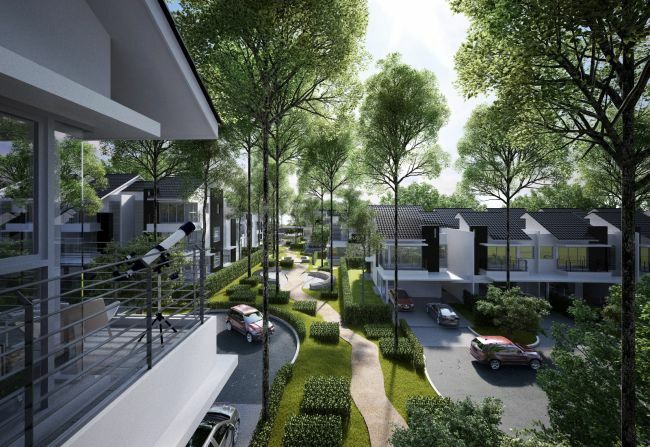 The SP Setia brand has grown regionally with the developer's first international foray into Vietnam in 2007 when it joined forces with the country's top state-owned conglomerate Becamex IDC Corp to develop EcoLakes at the MyPhuoc Industrial Park. In 2010, EcoLakes was named first runner-up in the FIABCI Prix d'Excellence Award for Best Development Master Plan. Following this success, the group has also launched a mixed development project called Eco Xuan at Lai Thieu in Tuan An District, Binh Doung Province. UDA Holdings Bhd hopes that a fair and commensurate compensation will be offered by MRT Corp Bhd to the affected party and Bumiputera traders if its building, Bukit Bintang Plaza (BB Plaza), has to be demolished. 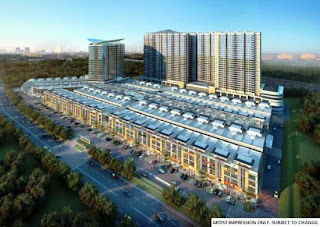 There is a possibility that the plaza including a part of the Yayasan Selangor building will be demolished to make way for the building of an underground station under the government's mega project, My Rapid Transit. UDA's Chairman, Datuk Nur Jazlan Mohamed said if the BB Plaza is demolished, the company stood to lose 25 per cent or RM20-RM25 million of its annual revenue comprising rental collections from its lots in the building. "Nevertheless, what also concerns us is the potential losses to the Bumiputera traders who would be affected throughout the implementation of the MRT project which is estimated to take four to five years," he told reporters after launching the transformation of UDA's information technology system. Todate, 150 retailers or 60 per cent of the retailers in BB Plaza are Bumiputeras. "We have also projected that the fair amount of compensation to be paid out for demolishing the building should be in the region of RM370 million," Nur Jazlan said. He said the plaza would also be its third building to be surrendered to MRT Corp in making way for the MRT. Other two buildings that have already made way are the UO Superstore and Plaza Warisan. "We had received RM80 million for those two buildings from MRT Corp even if the property value for the buildings currently stands at RM120 million. This however is a sacrifice made by UDA to ensure that the government's economic develoment plan is successfully carried out." Nur Jazlan also said that no definite date has been given on when MRT Corp would be taking over the building as it was still under discussion. Nonetheless, any decision would depend on the Ministry of Finance which is the ultimate owner of UDA, he said. On the transformation of UDA's information system which is to cost RM13 million, Nur Jazlan said it was part of UDA's efforts to provide more efficient services to its clients.